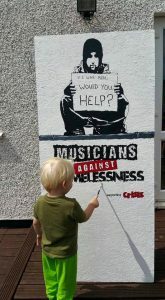 Musicians Against Homelessness is an initiative set up by Emma Rule in 2016 with a twofold aim: to raise money for the homeless and to help young musicians to get gigs and exposure for their music. The following blog post is based on a telephone interview with Emma Webster on 18th October 2017. I started volunteering at homeless charity Crisis about four or five years ago, while at the same time I was starting to work with young bands, giving guidance and advice on how to promote themselves. It’s really difficult for bands to get gigs without some help, especially at festivals, as there’s usually hundreds of bands fighting for slots. I had this idea that there was a way for bands to find gigs, to get PR and that could be done with a social conscience and raise money for charity at the same time. So I went on social media to ask if any bands wanted to play a gig to raise money for Crisis at Christmas. I got a huge response and I thought, ‘Hmm, I think I’m on to something here’. I also saw how it could also work for live music venues and spaces not already used much for live music, to help bring people in by providing a great night of music and also hopefully turning the media spotlight on them. I thought that we needed a patron that knows the music business well and is well respected, so I got in contact with Creation label boss, Alan McGee, who got it straight away and so Musicians Against Homelessness (MAH) was born. We have zero budget and, to start with, it was just me at my kitchen table with a computer and a Facebook page, but when we launched in March 2016 we had thousands of enquiries and a lot of media interest. Fortunately many people were interested in becoming regional managers for the project too, these people are really at the heart of bringing together all aspects involved in organising the gigs and engaging the community. Our gig month is September but we had consistent media over a 6 month period from the national press, radio, music press and local media. The easiest part of all this has been the media, in fact; they really get it. The first year we put on about 120 gigs and small festivals with about 550-560 bands playing in community centres, churches, pubs, venues, you name it. The aim is to support upcoming artists and we managed to put on around three quarters of all the bands who contacted us wanting to play. 2017 was a bit like doing the second album; we were a bit worried at first that after exploding in the press last year we wouldn’t do as well, but we have done well, if not even better. Like last year, most gigs were in September but we also had some in October; we’ve had about 120-130 gigs this year and well over 600 bands played. We’re also now associated with a few festivals who have put on MAH bands, such as Lindisfarne and Soccer 6, a music and football tournament. Many of the venues we use give us the space for free, but some have a small charge, which comes out of ticket sales, and often have sound engineer costs. A lot of the venues we work with don’t usually have a charge for any events they put on, unless they are specifically a live music venue. The bands play for free, although some event managers do help out with travel costs and riders etc. Quite a lot of gigs are pay-by-donation but the majority have a ticket price. The gigs have a dual purpose: it’s as important we do well for our bands as it is to raise money, so we want to have a full venue for them. The average ticket price, then, might be about £5, even for more well-known bands. In 2016 we raised around £45K and this year we’re expecting close to £100K as a rolling total. It’s all done via social media and the money goes directly to Crisis in England, Scotland and Wales and Simon Community in Northern Ireland. No money goes to MAH and nobody takes a salary. Every single person who helps organise the gigs is a volunteer; pretty much everyone has a day job. We have regional managers who are often very well connected within the music industry. Even if I interviewed 10,000 people I couldn’t have found a better team of people. We have people who work in PR, promoters, band managers, ex-policeman, a teacher, a real mix of people who love live music and the charitable aspect of what we do. I’ve never actually had a face-to-face meeting with most of the team, though; it’s mostly done on social media. The regional managers look after up to fifteen event managers each, which might be a venue, a band, or a member of the public, just someone who gets in contact and says, ‘I want to put on a MAH gig’, and who will book the venue, book the bands, etc. The volunteers are amazing. The biggest hurdles we face are not having any money. It’s cost me money, in fact. Trying to function without any resources, just me and a laptop and post-it notes stuck to my head, is hard. The workload is immense at times, particularly when we are all trying to juggle workload and family. I’m so committed to it, though, so I put a huge amount of pressure on myself to deliver what we’ve said we’ll deliver. It’s more than a full-time job. For five or six months of the year i am often working all hours of the day. In 2016 I was working nights as a full-time carer so that I could do this during the day. After the madness of this September, we’re already starting to work on 2018, and we’re also working on our Christmas ‘text donate’ campaign, which last year had the backing of people like Liam Gallagher, Russell Brand and Lily Allen. We are talking at two music and literature conferences in November. I’m so pleased about the exposure for the homelessness cause. It makes it all worth it, knowing that something is happening. 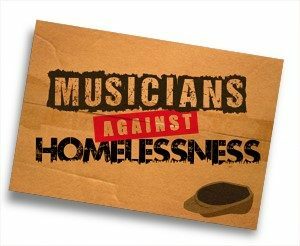 I think that musicians are particularly attuned to homelessness. There’s quite a lot of street musicians who are homeless and it’s quite close to home for many musicians, I think. I’ve had emails from musicians saying thank you for doing what we’re doing, that they’ve been homeless themselves and now want to give something back. Musicians have long been associated with charitable causes but maybe the difference with MAH is that previously many charities have used high-profile musicians—just think of Live Aid as an example—but MAH is all about what can we do for the musicians as well and this project has grown organically, from the ground up. Our musicians want to do it for charity, but i’m sure they also like the benefits of opportunities and the PR which is part and parcel of this project. Live music venues are closing, which is affecting bands having a place to play, or venues offer ‘pay-to-play’, which is all a bit of a sad state of affairs. Bands can end up so out of pocket. To try and find a venue , finance themselves, promote themselves and dedicate time to writing, rehearsing and performing is time consuming and i’m sure at times stressful. Having to treat your passion and talent as a business when all you want to do is perform is no doubt a common frustration. For MAH, a band can apply to anywhere in the country so they don’t just have to play their hometown. One band this year played about 6 regions across the UK, and many choose to get on a line-up in an area they’ve not had the opportunity to play before, so MAH is also helping bands to get to play in other areas of the country. While I’m really proud of what we’ve achieved for our charities, I’m equally proud of the work that we’ve put in for the bands and the attention we’ve endeavoured to give to our supporters. Some bands had only played a couple of gigs before MAH and it’s lovely to see that they’ve grown in confidence since. They get to be part of a bigger organisation and might get to be the support act for a bigger act, plus they can say that they’ve played for an organisation with the patronage and endorsement of Alan McGee. . These sorts of things for me are fantastic. There’s been so many rewards, though, even though it’s so challenging: great events, discovering some fantastic up-coming artists ,people emailing to say thank you. I was awarded a Points of Light award by Theresa May at Downing Street earlier this year for outstanding voluntary work. We are not a political organisation, and although good to have our efforts recognised in some way, our rewards are found in our strong ‘MAH’ community across the UK. As well as the bands and the fundraising, MAH gigs are also about community. Some MAH gigs are in little villages and the whole village has come out to support the gig, and even to make cakes and run raffles! We try to include every genre and all sorts of abilities and we’d like opportunities to be accessible for everybody. If you want to listen to music or make music, you can join in; it’s inclusive for everyone. A young classical piano student approached me earlier this year, she was quite nervous as she’d not done anything like this before, and asked me, ‘Would I let her be an event manager?’ YES! She pulled in some local rock bands, secured a local venue, put on a fantastic show and a great audience attended. Her confidence went sky high, and I’m thanking her and she’s thanking me … The same person wants to put on a classical MAH gig next year and asked me, ‘Is that alright …?’ YES! We’ve had punk, ska, rock, jams, acoustic and even a homeless choir. I can’t think of any genre that we haven’t had! We absolutely must include everybody in this that would like to get involved. Music is for everybody and there is an audience for everybody. So it’s not just about raising money; it’s about the whole package.